1 Place the nuts in a food processor and blitz for 1-2 minutes until finely chopped. Add the fruit and flaxseed, and continue to blitz for 3-4 minutes or until the mixture has bound into a paste. 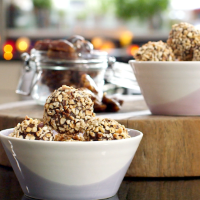 2 Divide the fruit and nut mixture into 20 x 20g pieces, and using wet hands roll into round balls and place on a tray lined with baking parchment. 3 Finish by dipping each ball into the melted chocolate. Then, before the chocolate sets, roll in chopped nuts Return to the lined tray and allow to set. Store in an airtight container. This recipe was first published in Thu Apr 30 15:37:55 BST 2015.